That seems a rather depressing prospect for the 86 million people living in Vietnam today, don’t you think? In America these days, the American Physical Therapy Association advocates that new entrants to the profession of physical therapy be educated at the doctoral level. Yet USAID-funded programs, such as Health Volunteers Overseas (HVO), routinely send American and Canadian volunteers to Vietnam for two to four weeks at a time to offer clinical instruction to graduates of two-year PT tech schools. Even without looking closely at the results of such a program—which I can assure you are abysmal—could any reasonable person suppose that Vietnam will ever “catch up” to the standards of rehabilitation offered elsewhere in the world? Vietnam and America’s histories are closely intertwined, in ways that many Americans would prefer to overlook. Even as Vietnam emerges from the grinding poverty and isolation of the bleak decades of US-imposed embargo, parts of that shared history bequeath a twisted legacy to the future. Most significantly, Vietnam is isolated by language. When you consider that most of the fluent English-speakers in Vietnam were associated with the losing side of a long and bitter civil war, it’s not surprising that they would subsequently be excluded from the educational system and the government of Vietnam. 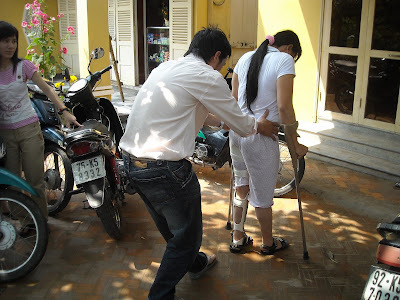 Thus, there are very, very few people in Vietnam today who are truly fluent in English—and those who are most assuredly are not Vietnamese physical therapy technicians! Translators--even those who are graduates of university level programs--may have had little or no previous exposure to foreigners. Even if a foreign volunteer should be lucky enough to be assigned a translator who is actually capable of conversational English, the sorts of things that physical therapists need to talk about are not in the normal English language curriculum. Indeed, there is not even Vietnamese vocabulary for much of what we need to say. How is it reasonable to expect that anything productive will come from this doomed attempt at communication? That statement stunned me, as it is so hard to perceive what is really going on when you stand outside of both the language and the culture of a place. But now, two years later, I know that that physical therapy student was telling me the truth. Even after two years of working continuously at one facility, with one dedicated translator, I cannot honestly say that I have been able to significantly change practice there. On the other hand, I recently had the opportunity to work alongside two volunteer occupational therapists in the rehabilitation department of a different hospital, under the dynamic leadership of two progressive, open-minded physicians and what we were able to accomplish there in a mere two months was simply amazing. Those two physicians had--many years ago--studied about rehabilitation: one in Israel and the other in Philippines. They were ready, willing and able to support and implement new ideas introduced by foreign therapists. Had they actually had full training as therapists, they would have implemented those changes themselves, over ten years ago. We believe that young, government-employed physicians with a special interest in rehabilitation should be provided the opportunity to study for an entry-level doctorate or masters degree in physical therapy in America. (It goes without saying that they would first need to study English for a year in America to enable them to get the best results from their studies.) Right now, most Vietnamese hospitals are fully staffed with minimally trained PT techs that are going to stay in those positions until they retire, decades from now. It’s actually difficult for new graduates to find a position. Trying to change practice through the existing school system is futile in the short term as new PT technicians would rank below everyone else in seniority and be unable to “buck the system.” Fully trained, Vietnamese physical therapist-physicians, however, would be able to step into any existing physical therapy department in Vietnam with the knowledge, skills and the authority to ensure the delivery of good quality rehabilitation. There is an idea in America that any Vietnamese person would never return to Vietnam, should they be permitted to enter the US. This is a very simplistic view, which does not begin to take into account how much life has changed for the better in Vietnam recently and how much more comfortable it is to live within the circle formed by one’s own family, culture and language. Government positions in Vietnam are highly sought after, even considering the low salary levels of both Vietnamese PTs and MDs. Employment by the state assures one of job security, health care, four month paid maternity leave, disability pay and a full pension after thirty years (at age 55 for women and at 60 for men). Additionally, therapists and physicians routinely develop private practices to supplement their government salary. I’ve lived in Vietnam for the past three years and I wouldn’t care to live anywhere else. The cost of living is low and the pace of life here is very, very pleasant. 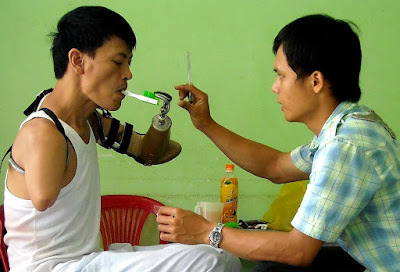 It’s simply naïve to assume that any Vietnamese person would willingly abandon such a life.